Students walk through the Sather Arch in the early morning light on the campus of the University of California at Berkeley on Sept. 9, 2015. UC Berkeley has launched an investigation into a former member of the men’s rowing team whose father was named in a federal indictment that exposed an elaborate college admissions scam. Jordan Sidoo’s father, David, is a Vancouver, Canada, businessman and former Canadian Football League player who is accused of making two $100,000 payments to have someone pose as his two sons to secretly take exams — including the SAT and the Canadian high school graduation exam — in their place. The younger son, Jordan, allegedly submitted a phony 2,280 SAT score to UC Berkeley, where he was admitted in 2014 and recruited to the rowing program. David Sidoo is accused of paying the first $100,000 installment in 2012 after having a surrogate fly to Vancouver from Tampa, Fla., to take the SAT using a fake ID card with the name of his older son, Dylan, on it. Dylan had previously taken the exam himself and earned a 1,460, so the surrogate was directed to not score too high — because a high score might raise suspicions. The surrogate earned a 1,670 out of 2,400, according to court documents. According to court records, the elder Sidoo also agreed to pay to have someone pose as Dylan to take the Canadian high school graduation exam for him. The falsified SAT scores were sent to Chapman University, where Dylan attended until 2014 before transferring to USC. Sidoo followed a similar process for his younger son, Jordan, in 2013, prosecutors allege. He is accused of paying for a flight from Florida and having a surrogate use a fake ID to take the SAT at a high school in Orange County, fraudulently earning Jordan a 2,280. He paid $5,000 for travel expenses for the surrogate test-taker, according to the indictment. Jordan’s scores were sent to Yale, Georgetown and UC Berkeley, where he later enrolled. Sidoo pleaded not guilty to conspiracy to commit mail and wire fraud in federal court in Boston last week. If convicted, he could face up to 20 years in prison. Neither Sidoo’s lawyers nor his sons could be immediately reached for comment Tuesday. 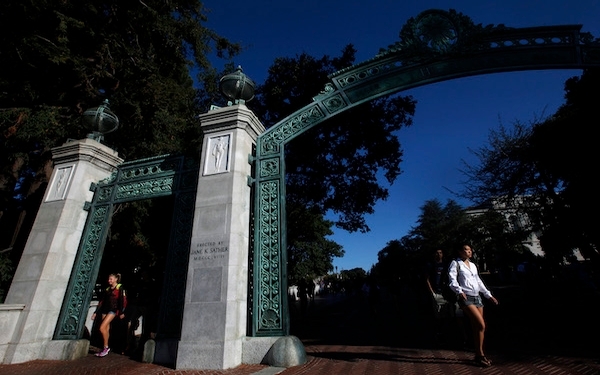 UC Berkeley is one of two University of California campuses implicated in the scandal. Jorge Salcedo, the soccer coach at UCLA, was placed on leave last week following an indictment alleging he accepted $200,000 in bribes for helping two students gain admission to the university as soccer recruits, although they did not play the sport seriously. UC President Janet Napolitano has ordered a systemwide investigation into UC involvement in the college admissions scheme. The federal investigation revealed instances in which coaches at some schools — including UCLA — were bribed to help students gain admission. There is no mention of similar allegations about coaches at UC Berkeley in court documents. UC Berkeley athletics spokesman Herb Benenson said Jordan Sidoo was an active member of the rowing team for the 2014-15 academic year. Benenson said that because of federal and state privacy laws, he could not disclose whether Jordan competed in any races or participated in training. The younger Sidoo served as coxswain, a position at the back of the boat, on his high school’s rowing team, according to a 2014 article in the Province, a newspaper in British Columbia. The article describes how rowing was his path back into playing sports after working through surgeries and braces for his clubbed feet and breaking his arm in a basketball game in ninth grade. Jordan Sidoo left the rowing team after his freshman year at UC Berkeley. He graduated in May and works at an encrypted messaging start-up he founded called Disappears.com, according to his LinkedIn profile.